Our Blog > Redefining the wind generation industry by aerodynamically structuring wind before its arrival to the turbine. Leviathan Wind Energizer, LLC, incorporated in New York, intends redefine the wind generation industry with its innovative approach. By aerodynamically structuring wind before its arrival to the turbine, Leviathan has developed an increased level of performance for wind farms. The company’s first patent was granted in the US in May 2012. The Wind Energizer™ can typically enhance power output by 20-40% and, at times, by over 100% at lower wind speeds. By increasing the effective velocity in the plane of the blades, it rewrites the world wind map – current wind farms can increase their profits significantly and previously unprofitable areas for wind farms can now become lucrative sites. The Wind Energizer™ is a passive aerodynamic structure that partially surrounds the base of the windmill from a calculated distance to increase the wind speed flowing through the rotors of the turbine. It is precisely constructed for each turbine based on wind flow and turbine geometry using computer models developed in the field of Computational Fluid Dynamics. The Wind Energizer™ has a unique set of patents; zero competition; and an anticipated B2B sales stream to wind farms. It has been proven with test and control turbines as shown in a testing center in Israel’s Negev Desert. Every large wind turbine owner in the world is a potential customer. This market consists of approximately 300,000 existing turbines, growing by over 30,000 turbines per year. An additional, extremely valuable feature is the product’s effect on the turbine gearbox. Each extra year of life for a gearbox could be worth up to $100,000. The Wind Energizer™ converts the wind approaching the blades into a uniform velocity, so that the normal stresses on the turbine from the greater velocity at the top of the blades are practically eliminated. Many wind farms around the world have a problem finding proper maintenance support for turbines in isolated areas, both in terms of equipment and manpower. Therefore the maintenance of theses turbines is an even more important issue. When the effect on the gearbox is quantified, it is likely that the total return on investment for the customer will, in many cases, be one year or less! There is additional income from carbon credits where available. When the effect on the gearbox is quantified, it is likely that the total return on investment for the customer will, in many cases, be one year or less! There is additional income from carbon credits where available. 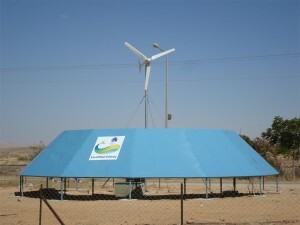 A team, consisting of scientists and venture capitalists, assembled by Tel Aviv University for the International CleanTech Open Competition, judged the Wind EnergizerTM as Israel’s third best clean technology for the year 2010. The product was examined by a number of technical teams: the CTO of DeWind asked for an exclusive; the CTO of Suzlon Energy wanted to bring it to his company; and a team at the highest levels of General Electric wrote to us that it was a “game-changing technology”. However, manufacturers are not customers, and we need to demonstrate it to the customers, the wind farm owners, in their own market. A budget of $1 million per market makes a complete demonstration, testing, and certification package. 50 Pings/Trackbacks for "Redefining the wind generation industry by aerodynamically structuring wind before its arrival to the turbine."